Instructions (See Product Insert For Pictures) Read these instructions carefully before using this appliance and save them for future reference. The Fusion Master is intended for indoor household use only. Wash all the parts that could come in contact with food before first use (see Cleaning Guidelines). Assembly for Mincing 1. Ensure the suction foot’s ring (L) is in the unlock position. 2. Place the suction foot (K) on a clean and stable countertop. Slide the hopper (E) into the suction foot’s groove (J) (fig. 2). 3. To bond the suction foot to the countertop and lock the hopper to the foot, turn the ring (L) to its lock position. Make sure all the parts are locked together. 4. Slide the mincer screw (C) into the hopper. The metal end should be on the hopper’s front side facing outward. 5. Fit the cutting fan (I) on the mincer screw with the flat side facing outward. When securing the fan, make sure the metal end of the mincer screw is protruding. NOTE: The product will not work correctly if the flat side of the cutting fan faces towards the mincer screw (fig. 3). 6. Select and mount one of the mincer discs (B) onto the hopper’s front with the tab fitting into the groove on the hopper’s front (fig. 3). 7. Follow the arrow towards the lock pictogram on the screw ring. Turn the screw ring (A) counterclockwise gently with your index finger only. As soon as you feel resistance, turn an extra 90° (or ¼ of a turn) and then stop turning. 8. Slide the crank (G) on the gear side of the screw and fix them together by rotating the crank screw (you can also do this after step 4). How to use your mincer 1. Do not use the Fusion Master without any ingredients inside the hopper. 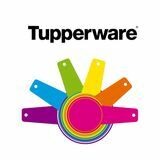 This can cause damages to your product and is not covered by the Tupperware Guarantee. 2. After assembling the unit, place a bowl or container below the head to collect the minced food flowing through the mincer disc. NOTE: Completely thaw food but leave cold before mincing. This product is intended for household use on boneless meat only. Check meat for bones or unwanted fat and remove before processing. Clean meat and dice into cubes sized to fill the hopper. With fatty meats, smaller cubes work best. 3. Turn the crank clockwise to process the food. If necessary, use the plunger (F) to keep the food moving. Do not apply excessive force, as it will only make processing more difficult and could damage your mincer. NOTE: Always use the plunger provided. Never use your fingers or any other utensils (spatula, knife, etc.). 4. Food may jam in the mincer screw during operation. Should this occur, turn the crank counterclockwise a few times to release the jam and then revert to the forward direction. Again, do not apply excessive force. NOTE: Do not try to mince food with hard fibers (ginger, nuts, etc.). How to make sausage 1. To create traditional or healthier sausages such as chicken sausage, mince food until you achieve desired texture and mixture. This can be done prior to using the sausage insert. 2. Assemble the sausage insert by following assembly steps 1–6. Slide the sausage insert (H) through the screw ring, align the cut-outs with the splines and slide into place on the screw ring until you hear it click into place. Then, follow assembly step 7. 3. Slide the entire sausage skin over the sausage insert and knot the end. We recommend using type 32/34 hog casings. 4. To create the desired sausage tube, press the sausage skin around the sausage insert and control the squeezing pressure while processing the food. When finished, knot the other end. 5. To create sausages of any length you prefer, use your fingers to squeeze at the desired length and turn the sausage around its own axis once or twice. This can be done during or after all food is processed. Knot the end to close the last sausage. Cleaning Guidelines Immediately after use, thoroughly clean all parts used to process food. The Fusion Master is dishwasher safe. However, it is recommended to hand wash and dry the metal parts and the suction foot. If you clean the foot in the dishwasher, rinse it in clear running water immediately afterwards. Without attempting to completely remove it, gently push down on the silicone tab of the foot to release water. Do not use abrasive cleaners, scouring pads, knives or other sharp utensils in contact with the silicone disc of the foot. Do not attempt to open the foot. Do not let the cutting fan come in contact with other metal, ceramic or glass instruments, as this would damage its cutting edges. 10. Chipotle Beef Tacos 11. Crab Cake Burger 12. Feta & Red Pepper Turkey Burgers 13. Hawaiian Chicken Burgers 14. Italian Chicken Burgers 15. 1. Assemble Fusion Master with coarse mincer disc. Place bowl underneath hopper. 2. Fill hopper with as many black beans as will fit and turn handle to begin processing. Once there is room in the hopper, add garlic and onion followed by remaining black beans until all have been processed into bowl. 3. Add remaining ingredients to black bean mixture in bowl and stir to thoroughly combine. 4. Heat Chef Series 12" Nonstick Griddle over medium-high heat. 5. Separate black bean mixture into 6 patties. 6. Drop each patty onto griddle and flatten slightly. 7. Once patties begin to firm and turn golden brown on the pan side (about 2–3 minutes), flip over and cook an additional 2–3 minutes until patties are firm and cooked through. 8. Serve warm with desired toppings such as lettuce, additional cheese, sliced bell peppers or avocado. 1. Assemble Fusion Master Mincer with coarse mincer disc and place bowl underneath. 2. Place pork into hopper and turn handle to grind meat. Repeat with remaining pork until all is ground. 3. Mix seasoning blend, sage and syrup into pork and use Hamburger Press to form patties using approximately ½ cup ground meat per Hamburger Keeper. 4. Place patties onto griddle and flatten slightly. 5. Once patties begin to firm and turn golden brown on the pan side (about 2–3 minutes), flip over and cook an additional 2–3 minutes until patties are cooked through. 1. Preheat oven to 450° F/232° C. 2. Assemble Fusion Master Mincer with coarse mincer disc. Place bowl underneath hopper. 3. Place chicken into hopper 5–6 pieces at a time, pressing down as necessary with plunger turn crank to grind meat. Continue until all chicken is processed, approximately 3 cups. 4. Stir egg and salt into ground chicken. 5. Form chicken nuggets using a tablespoon. Flatten to make a thin nugget. 6. Press nuggets into breadcrumbs to coat. Spray lightly with vegetable spray to help with browning. 7. Place nuggets onto baking pan lined with Silicone Wonder Mat. Bake for 10 minutes or until golden brown. Serve warm. 1. Assemble Fusion Master with coarse mincer disc and place medium bowl underneath hopper. 2. Fill hopper with chicken and turn handle to process. Once there is room in the hopper add garlic and onion, followed by more chicken. Continue processing until all chicken, garlic and onion is processed. 3. Add breadcrumbs, seasoning, egg, and Parmesan to chicken mixture and stir to combine. 4. Once combined, use ice cream scoop to help form mixture into meatballs. 5. Place meatballs in base of Microwave Pressure Cooker. Cover with marinara sauce. Seal and microwave on high power 15 minutes. 6. Remove from microwave and allow pressure to release naturally until red pressure indicator fully lowers, about 6–8 minutes. Check to ensure internal temperature of meatballs has reached 165° F/75° C. 7. Serve warm, topped with Parmesan cheese. 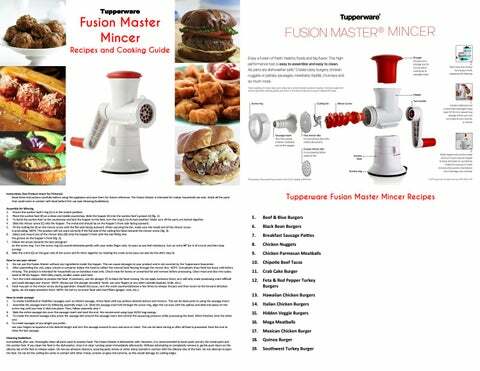 Assemble Fusion Master with coarse mincer disc. Place bowl underneath hopper. Fill hopper with as much beef as will fit in hopper and turn handle to begin processing. Once there is room in the hopper, add onion and garlic and continue to process. Continue to fill hopper with beef until all has been processed into bowl. Add seasoning blend to beef in bowl and mix together to thoroughly combine. Place beef in TupperWave Stack Cooker Colander, inserted into 1¾-Qt. Casserole. Cover and microwave on high power 8–10 minutes, or until beef has completely cooked through. Stir halfway through. 7. Add beef to taco shells and serve with desired toppings. 1. Place shallot in base of Power Chef System fitted with blade attachment. Cover and pull cord until finely chopped. 2. Add crab meat to Power Chef base, cover and pull cord until crab is roughly chopped. Place into medium bowl. 3. Add 1 cup breadcrumbs and remaining ingredients to crab mixture and stir to combine. 4. Sprinkle 2 tbsp. of breadcrumbs into the base of each Hamburger Keeper. Press about ½ cup of crab mixture into each Hamburger Keeper. Then sprinkle 2 more tbsp. breadcrumbs over crab mixture pressing down gently to adhere. Seal and freeze up to 1 month or cook immediately. 5. To cook, place 2 tbsp. vegetable oil in sauce pan and heat over medium heat. Once oil is hot place patties two and a time in pan and cook until golden brown, flip and repeat on other side until golden brown and heated through. 1. Assemble Fusion Master Mincer with coarse mincer disc and place bowl underneath hopper. 2. Fill hopper with turkey and turn handle to begin processing. Continue to fill hopper with turkey until it has all been ground into bowl. 3. Mix feta, salt and pepper into turkey and shape into 4 patties. 4. Heat Chef Series 12" Nonstick Griddle over medium heat. 5. Place burgers on heated griddle and cook until brown on both sides and internal temperature reaches 165° F/75° C, about 5–6 minutes per side. 6. Serve topped with roasted red peppers and any other desired condiments. 1. Fit Fusion Master with fine mincer disc. Place bowl underneath hopper. 2. Fill hopper with a small portion of chicken, and turn handle to begin processing. 3. Once there is space in the hopper, add garlic and half the onion. Continue to process, and as there is space in the hopper, continue adding chicken until it is all processed into bowl. 4. Add half the can of pineapple to the hopper, reserving 5 slices for garnish, and turn handle to process pineapple into bowl with chicken. Discard any extra pineapple juice left in the Fusion Master. 5. Mix cheese, breadcrumbs and salt into chicken mixture in bowl. 6. Heat Chef Series 12 Nonstick Griddle over medium heat. 7. Shape chicken mixture into 5 patties. 8. Place patties onto griddle and cook until brown on both sides and internal temperature reaches 165° F/75° C, about 4–5 minutes per side. 9. Keep warm until serving. Top with remaining pineapple slices and red onion, and add barbecue sauce or any other desired condiments. 1. Assemble Fusion Master Mincer with coarse mincer disc and place bowl underneath. 2. Place chicken into hopper and turn handle to grind meat. Repeat with remaining chicken until all is ground. 3. Mix Italian Herb Seasoning, egg and breadcrumbs into chicken and use burger press to form patties using approximately ½ cup ground meat per burger form. 4. Heat Chef Series 12 Nonstick Griddle over medium heat. 5. Place patties onto griddle and cook until brown on both sides and internal temperature reaches 165° F/75° C, about 4–5 minutes per side. 6. Keep warm until serving. 1. Fit Fusion Master Mincer with coarse mincer disc. Place bowl underneath hopper. 2. Fill hopper with a small portion of beef, followed by a small portion of diced vegetables, and turn handle to begin processing. 3. Once there is space in the hopper, add more beef, followed by more vegetables. Continue alternating beef and vegetables until all is processed. 4. Using the Silicone Spatula, mix seasoning blend into beef mixture. 5. Heat oil in Chef Series 11” Fry Pan over medium heat. 6. Shape beef mixture into 4 burger patties. 7. Place burgers in fry pan and cook until brown on both sides and internal temperature reaches 165° F/74° C, about 4–5 minutes per side. 8. Keep warm until serving. Top with desired condiments. Preheat oven to 400° F/205° C. In medium bowl, whisk together egg and milk. Toss in bread pieces and whisk until a paste forms. Assemble Fusion Master with coarse mincer disc and place medium bowl underneath hopper. Fill hopper with beef and turn handle to process. Continue to fill hopper with beef until all has been processed into bowl. Repeat with onion, garlic and parsley, processing together into same bowl. 5. Mix salt, pepper and bread mixture into meat mixture. 6. Use ice cream scoop to portion 11-12 meatballs. 7. Place in UltraPro 3.5-Qt. Lasagna Pan and bake 15-20 minutes or until internal temperature reaches 155° F/66° C.
Assemble Fusion Master Mincer fitted with coarse mincer disc with a bowl underneath hopper. Place chicken breast in hopper and turn handle to begin processing. Rotate, placing tomato, onion, cilantro, olives and chicken into hopper until ingredients are ground. Season with salt and form patties using Hamburger Press. Sear in skillet over medium high heat until burgers are cooked through to 165° F/74° C.
1. Assemble Fusion Master Mincer with coarse mincer disc and place bowl underneath. 2. Place turkey into hopper and turn handle to grind meat. Repeat with remaining turkey until all is ground. 3. Mix Southwest Chipotle Seasoning, egg and breadcrumbs into turkey and use Hamburger press to form patties using approximately ½ cup ground meat per burger form. 4. Heat Chef Series 12" Nonstick Griddle over medium heat. 5. Place burgers on heated griddle and cook until brown on both sides and internal temperature reaches 165° F/75° C, about 5–6 minutes per side. 6. Serve topped with desired condiments. 1. In medium bowl, combine red quinoa, sweet potato, red onion and oatmeal. Stir and mix well until fully incorporate. 2. Add remaining ingredients and stir to combine. Press mixture ⅔ cup at a time into Hamburger Keeper. 3. Place 2 tbsp. vegetable oil in sauce pan and heat over medium heat. Once oil is hot place patties two and a time in pan and cook until golden brown, flip and repeat on other side until golden brown and heated through.